The European Commission awarded Glycanostics the prestigious Seal of Excellence for its revolutionary prostate cancer early diagnostic tests. 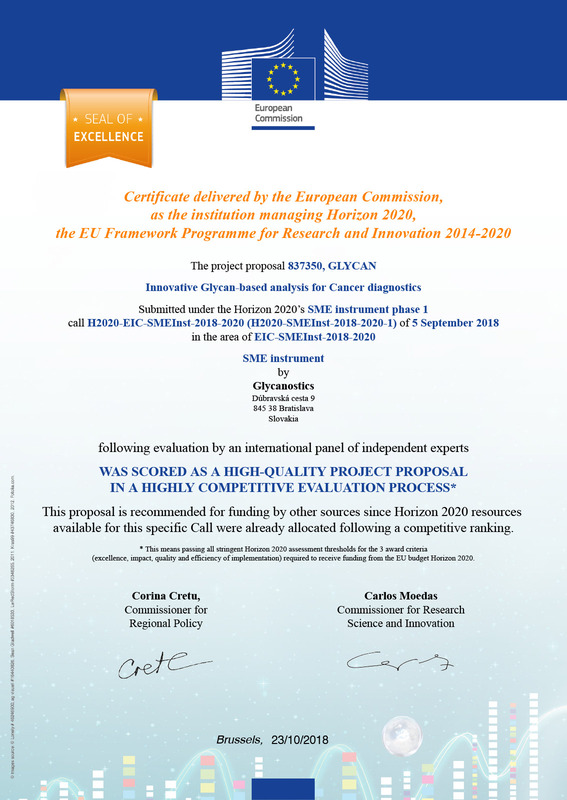 This project was submitted under the Horizon 2020 Programme for Research and Innovation 2014-2020, and received the highest scores for its proposal in the extremely competitive evaluation process. The European Commission has a rigorous evaluation system—with a panel of international, independent experts—based on three criteria: excellence, impact and quality, and efficiency of implementation. The Glycanostics’ team plans to continue with new H2020 submissions. Now, with the Seal of Excellence, the company's chances are significantly higher! This award also increases the investment appeal of the company as the Seal is a label of quality which identifies promising projects and recommends them for funding from alternative sources, be they public or private, regional or national, European or international. Horizon 2020 is the biggest EU Research and Innovation Programme ever. The program identifies and supports breakthroughs, discoveries, and world-firsts by taking great ideas from the lab to the market. The Seal of Excellence is a “high-quality” label awarded to those projects submitted to Horizon 2020 which were deemed deserving of funding, but did not receive it due to budget limitations. The Seal of Excellence Certificate rewards the best unfunded proposals with the ability to approach alternative regional, national, private, or public funding sources. In addition, it helps funding bodies wanting to invest in the most promising proposals (including national & regional authorities through European Structural & Investment Funds) to identify these projects more easily.